Another e-book of the “Reader’s Digest” variety that obviously is aimed at the “limited” reader. Limited as in not feeling like they have the time to peruse a “proper” book versus these watered down versions. As in the American Legend series I just reviewed on Duke Wayne, this book will not break the bank and just under 2 pounds, but it is fairly limited in the amount of information that is related about this iconic author. I was going to include this book review with my John Wayne review because it was Wayne’s role of Hondo in the picture of the same name that propelled L’Amour even further into the limelight as the film was adapted pretty faithfully from his book. He was not unknown at the time that Hondo was made (as a 3D film yet!) but the public reception of the film was such that L’Amour became even more popular as the preferred storyteller of America’s west. I grew up reading both Louis L’Amour westerns and those of Zane Grey as well. My father was a huge fan of both authors (with a definite preference to Grey’s novels) and because he had plenty of these books around the house I read them as well. L’Amour’s life, as chronicled by several interviews and articles over the years could have stepped whole out of one of his stories. He left home and “rode the rails” to find work and an education. He had left school at an early age to “round” out his learning as he felt the academic system used in the formal setting of his school was lacking. Coming from a family of readers and teachers, he already knew everything that he considered important from a scholastic viewpoint and was eager to learn more than what he had current access to. 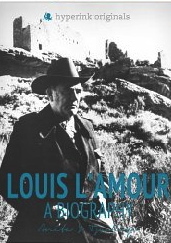 For a really great source of information on Louis L’Amour read his autobiographical novel Education of a Wandering Man. While the book is not all-encompassing, it does relate a lot of facts from the man himself. It is a fascinating inside look at the man who created such iconic sagas with the feudal and familial Sacketts. During his lifetime, L’Amour was: A boxer, miner, merchant seaman, naval officer, skinner and lumber man. All these on top of being a top-notch writer of western and adventure novels. He was also an accomplished poet and his daughter Angelique has published a collection of these in Smoke From This Altar. This biography does touch on a lot of information about L’Amour and it appears to be, again, aimed at the commuter market. For those who do not know who this fascinating man is, it is a good introduction. Sadly the only other biographical information out there is the Education of a Wandering Man and assorted interviews and magazine articles. If you are lucky enough to have access to some of his audio-books you can hear the man himself providing background and information on each of the books. If you have had the pleasure of reading any of his books you’ll know that the “About the Author” preamble states that he was, amongst other things, shipwrecked, stranded in the Mojave Desert, and was a world traveller. This book doesn’t really relate more than the most basic of information with the odd bit of information that delves a bit deeper. A 3 out of 5 star book just because it did tell me a few things that I did not know already, quite a feat considering that I have spent years in my spare time trying to learn as much as possible about this writer. When I lived with my parents, in the long ago days before video and DVD players, it was a family tradition to watch any westerns that came on the television. This usually occurred on the weekend, most specifically on a major TV network (NBC I think) on Saturday Night At The Movies. It was on Saturday nights that I sat with my folks, and later my bother as well, watching The Duke,Gary Cooper, and Robert Mitchum. In fact, all the old actors who had moved into the genre when they got too old to play romantic leads any more. We popped lots of popcorn and then rushed in to watch The Sons of Katie Elder, Rio Bravo or some other John Wayne “Americana” western. Or indeed whatever western happened to be on. If we didn’t watch westerns on the television, we saw them at the Drive-In. It was at the Drive-In that I first saw Sergio Leone‘s “Spaghetti Westerns.” Specifically the “Man With No Name trilogy. I was enraptured and captivated by this anti-hero. I was so enthralled by this character that I lost the tendency to emulate The Duke and began to squint a lot and speak softly through gritted teeth. This was at the ripe old age of ten. Oh I never fell out of love with the John Wayne westerns or old Duke’s characters. I could still do the swagger and do the “Well, Pilgrim” drawl like a trooper. I remember staying over at a cousin’s house and horse riding for hours, wearing the standard western uniform of cowboy boots and hat, riding for about three days straight from sun-up to sun-down. We were both so saddle sore it was hard to sit in a chair let alone walk. But every minute spent in the saddle was a minute spent recreating our favourite scenes from westerns of the day. I believe we were both about twelve. It wasn’t just “film” westerns I was infatuated with either. 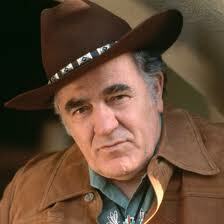 I also devoured every book I could read by the authors Zane Grey and Louis L’Amour. Zane Grey was my fathers perennial favourite. I liked old Zane, but, didn’t care for his colloquial dialogue that he insisted on using. All his characters said words like pahdnuh and mistuh just to name a couple. They were all spelt just like that, it could drive you to distraction after a while. L’Amour’s characters talked in the archaic language of the cowboy without the colloquialism’s. Unfortunately Hollywood stopped making decent westerns just after the bumper crop year of 1969. 1969 saw great westerns like The Wild Bunch, True Grit, Butch Cassidy and the Sundance Kid to name but three out of the many that were released that year. Then “The Dream Machine” started making psychological westerns instead of traditional or spaghetti westerns. These were a complete waste of celluloid. One such film did not have one gun in it. What kind of western is that? I knew though, that if I waited long enough that Hollywood would start making decent westerns again. I was right. My old Man-With-No-Name hero came out with the odd gem now and then.The Outlaw Josey Wales, High Plains Drifter and Pale Rider (really just a re-working of Drifter, but still good) and then…Unforgiven. Unforgiven showed that not only did old Clint still have the chops as a “western” actor, but that he was still one hell of a director as well. I still feel that Unforgiven was the “last hoorah” of the genre. I know I still like the cross genre westerns and some of the “modern” westerns (No Country For Old Men being the best thus far) and I even enjoyed the True Grit re-make that came outin 2010. But I do miss the old fashioned westerns as well as the “anti-hero” ones that came out in the late 60’s. Now I watch my old favourites via the DVD player and remember how much I loved them the first time I saw them. Watching them makes me feel simultaneously young and old. They also make me feel like strapping on my guns and looking for my brother to see if he remembers our gun battles and also feels young enough to have a go again. I think I might even want to play Tuco.